SACRAMENTO, CA — The California Chamber of Commerce has released its list of job creator bills, calling attention to 11 bills that will stimulate the economy and improve the state’s jobs climate. 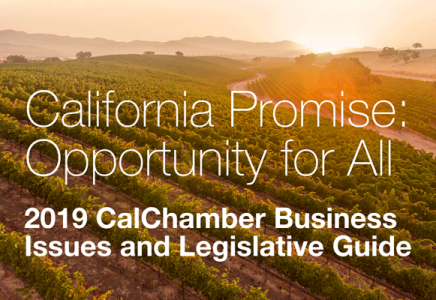 Since 2008, the CalChamber has identified bills that will encourage employers to invest resources back into the economy and local communities rather than spend them on unnecessary government-imposed costs. Keeping taxes on new investment and business operations low, fair, stable and predictable. Reviving local economic development tools. Reducing regulatory and litigation costs of operating a business—especially when hiring and keeping employees. Reducing the cost and improving the certainty and stability of investing in new or expanded plants, equipment and technology. Investing in public and private works that are the backbone for economic growth. Ensuring the availability of high-quality skilled employees. AB 1734 (Calderon; D-Whittier) Extension of Film Tax Credits — Extends California’s current tax credit for motion picture and television productions, which has a sunset date of July 1, 2020, for an additional five years, continuing the success of this tax credit, which has brought more film and television production jobs to this state and has increased business to California. AB 1743 (O’Donnell; D-Long Beach) Career Technical Education — Reauthorizes and provides appropriations for the Career Technical Education Incentive Grant program, which provides students with necessary training and education to prepare them for a variety of career options. AB 2016 (Fong; R-Bakersfield) Private Attorneys General Act — Mitigates the financial threat of frivolous litigation by requiring that plaintiffs provide a more detailed account of the allegations in the required Private Attorneys General Act (PAGA) notice, allowing an employer to utilize these financial resources to grow their workforce instead. AB 2482 (Voepel; R-Santee) Flexible Workweek — Allows for an employee-selected flexible work schedule and relieves employers of the administrative cost and burden of adopting an alternative workweek schedule per division, which accommodates employees, helps retain employees, and allows the employer to invest these savings into growing its workforce. AB 2509 (Waldron; R-Escondido) Employee Flexibility — Provides non-exempt employees, who work a traditional 8-hour day schedule, the opportunity to request an on-duty meal period in order to leave work 30 minutes earlier, which helps accommodate employee requests, retain employees, and offer more flexible work arrangements. AB 2770 (Irwin; D-Thousand Oaks) Sexual Harassment Employer/Employee Protection — Codifies case law to ensure victims of sexual harassment and employers are not sued for defamation by the alleged harasser when a complaint of sexual harassment is made and the employer conducts its internal investigation. This bill also provides additional protections to employers by expressly allowing employers to inform potential employers about the sexual harassment investigation and findings. Reducing the cost of frivolous litigation allows an employer to utilize these financial resources to grow its workforce. AB 2907 (Flora; R-Ripon) Private Attorneys General Act — Provides employers with a reasonable opportunity to cure specific Labor Code violations before being subject to costly and frivolous litigation under the Labor Code Private Attorneys General Act (PAGA), allowing an employer to invest this financial savings into growing its workforce. AB 2936 (Nazarian; D-Sherman Oaks) Extension of Film Tax Credits — Extends California’s current tax credit for motion picture and television productions, which has a sunset date of July 1, 2020, for an additional five years, continuing the success of this tax credit, which has brought more film and television production jobs to this state and has increased business to California companies that supply productions with goods and services. SB 832 (Portantino; D-La Cañada Flintridge) Extension of Film Tax Credits — Extends California’s current tax credit for motion picture and television productions, which has a sunset date of July 1, 2020, for an additional five years, continuing the success of this tax credit, which has brought more film and television production jobs to this state and has increased business to California companies that supply productions with goods and services. SB 951 (Mitchell; D-Los Angeles) Extension of Film Tax Credits — Extends California’s current tax credit for motion picture and television productions, which has a sunset date of July 1, 2020, for an additional five years, continuing the success of this tax credit, which has brought more film and television production jobs to this state and has increased business to California companies that supply productions with goods and services. SB 1243 (Portantino; D-La Cañada Flintridge) Career Training Education — Establishes the California State Pathways in Technology (CA P-TECH) program, to encourage and assist selected schools, in a public-private partnership, to prepare students for high-skilled, high demand jobs in technology, manufacturing, health care and finance. For more information on the 2018 job creator bills, visit www.calchamber.com/jobcreators.